There are stray thoughts that entertain me and seem to do little more. One such thought is that the human voice is on a certain level a musical instrument. It occurred to me after spending hours in an environment where I did not share any common language with those around me. Communicating the simplest thought was laborious. It was at that time that I experienced true exhaustion. I had not been performing heavy physical labour. I realised that it was solely mental fatigue that left me tired to the bone. At one point I was attending a demonstration in 1973 commemorating the 30th anniversary of the overthrow of Mussolini (in central and southern Italy. He still ruled two more years as a puppet of Germany in the north.) The speeches were fiery. The crowd was pumped up. I joined in the feverish applause despite not understanding a work. For a split second, the irreverent thought occurred to me that I would not have known the difference if I had shown up at a fascist demonstration instead. People ask me why I listen to music in languages I don't understand. I answer that the human voice is a musical instrument as well as a means of verbal communication. My lack of knowledge of a language forces me to focus on this facet of it. Karl Jenkins is a Welsh composer who has made this realisation the cornerstone of his musical compositions. He has composed a whole body of works in which he uses an invented language composed of words that have no meaning at all. The texture and lone of the lyrics conveys a mood. The most famous example of this is the song "Adiemus." Jenkins created Adiemus as a word in his lexicon of mood without fixed literal meaning and was told only later that it meant "Let us draw near". in Latin. The most famous example of Jenkinsian music is "Adiemus". I heard it first as the sound track of an automobile commercial in 1994. 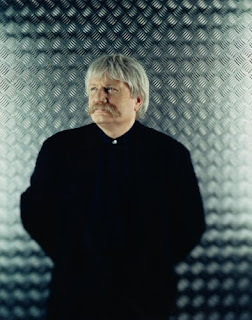 Karl Jenkins explains on his web site as follows the evolution of Adiemus and its underlying philosophy. "When I conceived the Adiemus concept initially, I was thinking of it purely as a recording. My intention was to compose a work based in the European classical tradition but with vocal sound more akin to ethnic or world music." Since Adiemus has risen in popularity around the world, it has become a growing entity meaning many different things to many different people. Vocally, the spread of influence grows wider all the time, taking in Arabic and African sounds as well as "Celtic" and ecclesiastical ones. The percussion too has expanded using Indian, Middle Eastern, Japanese, Chinese and even Australian instrumentation. Karl: "One of the things that has excited me has been how my initial idea of Adiemus as a recording project has evolved into a live experience. The live performances have taken on a whole new dimension. In fact, the Adiemus compositions themselves may be performed by any orchestra with any number of female voices." The article elaborates further on the transcendent quality of Jenkin's music. "The evolving nature of Adiemus has meant that it has been difficult to categorise. New age, classical crossover, world music, even pop. Karl sees this as a good sign: "To me, Adiemus transcends labels. That fact that it reaches people of different backgrounds, faiths and cultures gives it a universal appeal which is special. The compositions can be spiritual, religious, meditative - it's open to 'move' people in a away that they choose to experience." Jenkins makes a valuable contribution not only to music but to my understanding of language. There are times that I appreciate the literal meaning of words far more because of being aware of their emotive content. When I have been listening to Czech rock music all afternoon and then hear a country song in English, the country song has a vividness that I would not otherwise appreciate. I especially appreciate it when a country song plays on the uniqueness of English and its special set of overlapping meanings to words such as in song titles like "Two of a Kind and Working on a Full House." My all time favourite is "Papa was a rolling stone. Wherever he laid his hat was his home. When he died, all he left us was alone." It is hard for me to imagine either phrase working in another language. At the same time, it is interesting to reflect upon how the music reinforces the message. "Armed Man" was a work devoted to soldiers of all armies. It cuts across all political loyalties. I found this troubling until I recalled conversations with people from war zones who spoke of different armies not in terms of the ideology they purported to represent but how they behaved when passing through the village. One woman who was a loyal American citizen told me candidly that the Germans who occupied her town behaved far better than did the Americans. She did not state this confrontationally but in passing. It made the point vividly of representing whatever one believes with honour. How many people have been won or lost to a cause through a random act of cruelty or kindness? Jenkins has contributed a great deal to my appreciation not only of music but more of language. It is fascinating how he has undertaken to build bridges between different cultures and musical forms. His music does not fit neatly into any single genre. The stray thoughts at the edge of my world that the human voice is an instrument seems to be a central part of Jenkin's life work. A few weeks ago, out of random curiosity, I tried looking on line for the translation of"Adiemus" lyrics. In finding that there was no specific meaning to the lyrics, I learned something far deeper. It is for this reason that I join many in my gratitude to Kark Kenkins for his musical work.